I always swing into the Portland Womens Forum when I am in Corbett, Oregon to take in the view of the Vista House on Crown Point. I almost did not get out of the car to take this photo, but I am glad I did because it turned out being quite a gorge-ous display with the golden light hitting the waters of the Columbia River below and the moody clouds above. It is a gorgeous view of the river and sky.. Awesome photo. Enjoy your day! Yes, you did indeed capture some awesome evening light. This is one of my favorite Gorge views too. We live in the Portland, Oregon area and it still amazes me how beautiful the gorge is !!! There isn't anything like it as far as we are concerned. Thanks so much for sharing !!! Visiting from Little Things Thursday. Oh, yes!! 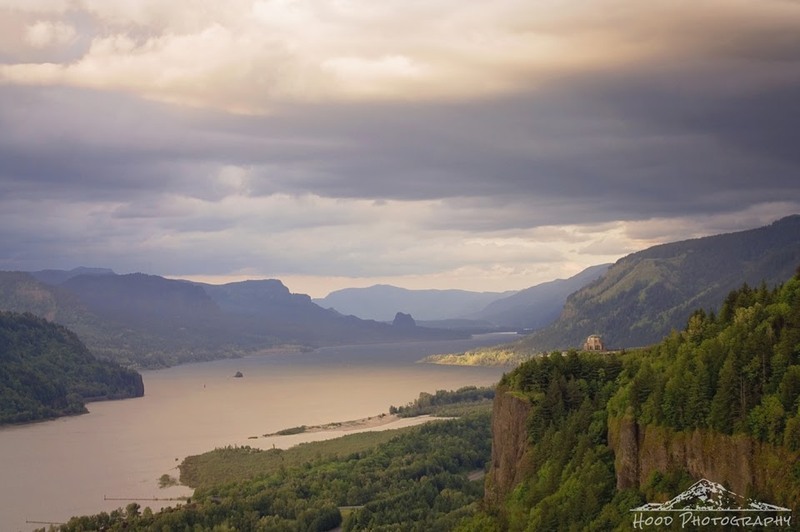 I agree with Rebecca, I live in Portland and the gorge never fails to amaze me with its beauty!! A breathtaking capture for the day!! Thanks for sharing!! Sometimes the photos we almost didn't take turn out to be some of our best! What a breathtaking view! Love it! Absolutely gorge-ous!! Needs to be printed and framed!! Stunning - those clouds and that river.. Such a beautiful landscape...it has great scope..
All the years I've driven through the Gorge, I've never gone to Vista House! This is a fabulous image! The Gorge is one amazing place. Magical colours in this beautiful landscape.